How long term insurance should last depends on the unique needs of your family as well as your long-term financial goals. For many families, a budget-friendly 10-year term life insurance plan is a good fit, even as their financial requirements change over time. Nevertheless, every family’s needs are different; it’s always best to use your financial plan as a guide when looking at life insurance quotes. In this post, we’ll show you how to determine your term insurance needs and where to get your quotes in minutes. How Will Term Insurance Support My Financial Goals? How long should term insurance last? The length of the term insurance policy that’s right for your family depends on your short and long-term financial goals. Let’s take a look. Here are just a few circumstances in which income replacement will be a primary objective in purchasing term insurance. Do you have a partner who relies on you for financial support? Is your partner currently employed full-time? If you are the primary breadwinner in your household, and you don’t want your partner to be forced to go back to work right away after your passing then you’ll need to replace that income. Many financial advisors recommend purchasing coverage that is ten times the equivalent of your current income. This may be too much or too little term insurance, depending on your individual circumstances—your coverage needs are based on what you want for your family. Does your partner have special needs or a disability? If your partner has special needs or a disability which make it difficult or impossible for them to work, then you’ll need to purchase coverage sufficient to replace your income and pay for the extra care—such as a home health aide and/or therapies—that they require. If they will require care throughout their lives, you may want to investigate whole life insurance options as well. Do you have children or other dependents? 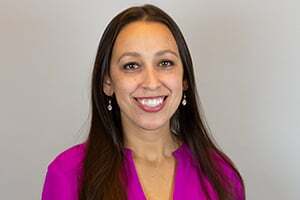 If you have children or other dependents, in addition to providing for their primary care, you will also want to provide funds to pay for the services that you may have provided, such as childcare. Do you want to contribute to, or pay, the costs of your children’s college education? If you are planning to help pay for your children’s college education, then it is wise to keep in mind that the average cost of college tuition has risen steadily over the past 20 years. If your children are young, they may face in-state tuition as high as 40k per year in just ten years. If you want to protect your children from the burden of loans (which the majority of students require), then allowing for a significant rise in college costs is essential in determining the amount of coverage that you wish to purchase. Will you provide for your children after they enter the workforce? Do I want to help pay for my children’s first home? Will I help my children as they graduate from college and become established in their careers? Do I plan to leave a trust for my grandchildren? Do you plan to provide support to your partner, or an elderly parent or relative during their retirement? If you planned to help your partner or an elderly parent financially in their golden years or if they require full-time or hospice care, then this expense should also be included when you look at life insurance quotes. Of course, these goals aren’t mutually exclusive. Depending on your family’s needs, all of these goals may be included in your financial plan. What Are Common Term Insurance Lengths? Depending on your age, you can choose a term length between 10 and 40 years. These are the coverage lengths that Quotacy can provide for you from our network of insurance companies. If you are a young family and you wish to safeguard your children’s financial future until they become independent. If you want to protect your family’s estate from long-term business debt that you personally guaranteed. If you have debt that may take awhile to pay off and don’t want to leave any behind to your family. Of course, they are many different circumstances that may arise that make it necessary to change the amount of coverage that you currently have. Thankfully, with term insurance, you have a number of options to make sure that you always have the protection that you need to keep your family secure. Buy what you can afford. Some life insurance is better than no life insurance at all. What Are My Term Insurance Options? There’s no rule that says you can only own one individual life insurance policy. Owning more than one policy, each with different term lengths is called laddering, or layering. For example, say your largest debt is your mortgage. The loan balance is for $350,000 and it’s a 15-year term. Taking this into consideration, you probably only need a 15-year term policy, right? Well, let’s also say you have three children who are 9 months old, two-years-old, and three. You and your spouse plan on paying for their college tuition. Your youngest won’t graduate college for at least 21 years. Let’s think about this. You know you want protection of at least $350,000 for 15 years (the mortgage). According to The College Board, the average cost of an in-state public college is $25,290 per year. So, sending three children to college to obtain their Bachelor’s degrees will cost approximately $300,000 total. You’ll want this amount of protection for at least 20 years. You could purchase one policy with a coverage amount of $650,000 and term length of 25 years OR you could purchase two policies—one with a coverage amount of $350,000 and term length of 15 years and a second one with a coverage amount of $300,000 and term length of 25 years. Consider the screenshots below. They are quotes for a 40-year-old female. As you can see from the screenshots, laddering the two policies would save you a few dollars each month. If you went with Option 2 to ladder the policies, after 15 years, the first policy would expire and you no longer would be paying for coverage you don’t need since your mortgage is now paid off. But you would still have the back up 25-year term policy to financially protect your family. Everyone’s needs are different and life changes. What are my fixed monthly household expenses? How much are my variable household expenses? Certainly, you don’t have to have precise amounts for all of the items above, but it is good to have some ballpark figures in mind as you think how much term insurance coverage you will need to secure your family’s future. Another important consideration when purchasing term insurance is your current budget. Term life insurance is ideal for most individuals because it can be customized to fit most budgets. For example, if you want a 30-year term policy with a coverage amount of $750,000, but don’t believe you can afford to keep up with the premiums long-term, then consider instead a smaller coverage amount or shorter term. Consider the options below. The quotes are for a female applicant who is 40-years-old. If you’re looking to lower your premium costs, which option do you choose? Lower the coverage amount or shorten the term? The right option really depends on your situation. For example, if your mortgage loan is a 15-year term and your children are over the age of 10, then going with the 20-year term over a 30-year term is a logical choice. On the other side of the spectrum, if your children are still in diapers, then lowering the coverage amount and sticking with the 30-year term is probably the wiser choice. Buy what you can afford. Some life insurance is better than no life insurance at all. Will I Qualify for the Term Insurance Premium Rates that I Want? Frequent international travel—such as for work or volunteering that involves traveling to areas that are listed as potentially dangerous by the State Department—will likely make your premiums higher than average. Don’t let the list above intimidate you. Insurance companies need this information to calculate an estimate of your risk of mortality, but don’t hesitate to apply because you have a few strikes against you. Quotacy works with all types of applicants who may face challenges in finding affordable life insurance quotes. Need a helping hand to understand your options? Our experts can help you find the term insurance coverage that you need at a rate that matches your budget. Click through to learn more about the best way to select a term insurance policy. How long of a term you buy is dependent on why you’re buying life insurance in the first place. Do you have a family and are looking to buy life insurance to protect them as you pay off the mortgage? Do you have children and also plan on paying for their college tuition? Or maybe you’re looking to buy life insurance to cover a business debt. When it comes to buying term life insurance the most common lengths are 10, 15, 20, and 30 years. So if you buy a term life insurance policy for 20 years, the day it becomes active it will insure you for 20 years from that date. 1: What’s your family situation? If you are planning on starting a family soon or have young children, like an infant or toddler, a 30-year term policy is a great option. It will protect your family as your children grow up and become financially independent themselves. 2: What’s your mortgage situation? Term life insurance is there to protect your loved ones from the what-ifs in life. If you were to die suddenly, the death benefit from a life insurance policy can ensure your family can stay in their home and not be uprooted. So making sure your term length matches your mortgage loan length is a great idea. 3: What’s your debt situation? Are there any debts you have that could become the responsibility of someone else if you were to die before the balance is paid? Any debt you have that is co-signed or part of a joint account will become the responsibility of that other person. Purchase a term length that takes into account how long it will take you to pay off these debts. If you and your spouse live in a community-property state even debts your spouse did not cosign may become his or her responsibility if the debt was acquired during marriage. Creditors collect what they’re owed from this pool and beneficiaries get the rest. Creditors can’t collect directly from these sources, they go to your beneficiaries directly. And even if your family members do not become directly responsible for your debt when you die creditors still want to be paid somehow. They will file a claim against your estate upon your death which takes away inheritance from your loved ones. Life insurance, however, is exempt from probate which means your loved ones will get the full death benefit amount even if there are creditors at large. 4. Do you need life insurance for your business? Another common reason people buy life insurance is for collateral for a small business loan. In order for a bank to approve your small business loan they want to make sure they’ll get paid if you die. Purchasing a term life insurance policy for the length of the business loan and naming the bank the beneficiary is common practice. It can be set up so that the bank gets paid first and then your families get the remaining death benefit. And if you need more coverage than 10 to 35 years, you could consider getting a permanent policy or laddering life insurance policies. Permanent life insurance lasts your entire life whereas term life insurance is temporary and is designed to only last during your family’s most financially vulnerable years and then drop off when you become more financially stable or in or near retirement. 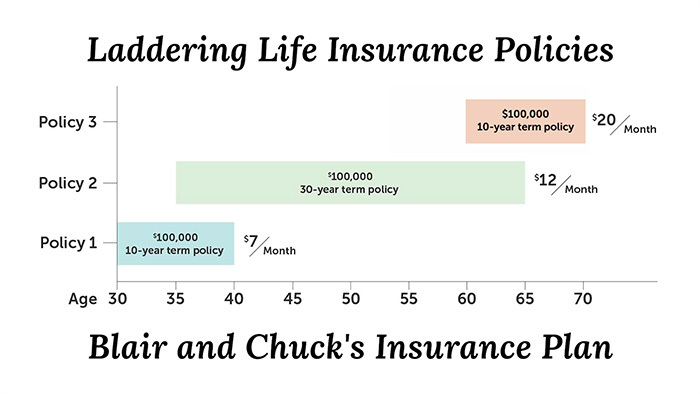 When you ladder term life insurance policies, this is when you own more than one policy with various amounts of coverage or at different stages of your life. Let’s take a look at an example buying three term policies all at once. Jim and his wife Pam just purchased their first home. They want to start a family soon. Jim decides to buy three term life insurance policies on himself naming Pam the beneficiary. 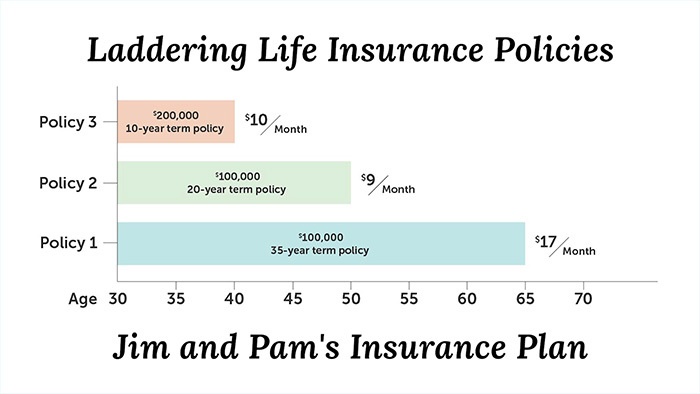 Policy one has a 35-year term and will insure Pam is financially protected through their prime working years. Policy two has a 20-year term and will make sure Pam can continue to pay the mortgage and start college tuition funds for their children if Jim were to pass away suddenly. Policy three has a 10-year term and simply adds extra coverage to ensure Pam will have the necessary funds to continue their family’s standard of living during their children’s most formative years. As the mortgage is slowly paid off and their children grow to become independent, their coverage needs also lessen, which makes this laddering method a strategic one. Now, let’s look at an example of buying three different term policies at different stages of your life. Blair and her husband Chuck are newlyweds on a budget. Blair decides to purchase a small life insurance policy on herself to make sure Chuck could pay for a funeral and take care of the debt they share if she were to die suddenly within the next ten years. Five years into their marriage, Blair and Chuck save up enough for a down payment and buy their first home. Blair then decides to buy a second term life insurance policy with a term length of 30 years, the entire length of their mortgage loan, so Chuck could continue to live in their home if she died. At 55 years old, Blair and Chuck are just a decade away from retiring. She wants to make sure if anything happened to her Chuck wouldn’t need to dip into his retirement savings to continue paying bills. She buys another small term policy with a 10-year term. Term life insurance is an affordable way to protect your family from the what-ifs in life. Tune in next week when we talk about what life insurance company niches are and how they can save you money on premiums. Bye!